The more complex a subject, the more important it is to appreciate that things aren’t always as black and white as they first appear. This is certainly true of bioenergy. Bioenergy – energy derived from plant or animal or organic material – is a research area with the potential to have a significant impact on our future as it could be an important part of the fight against climate change. However, its complexity can often be a barrier to public understanding and lead to polarised views, myths and misconceptions. Now a team from The University of Manchester’s Supergen Bioenergy Hub, funded by the Engineering and Physical Sciences Research Council (EPSRC), has brought colour to these shades of grey with a truly novel way of aiding comprehension. 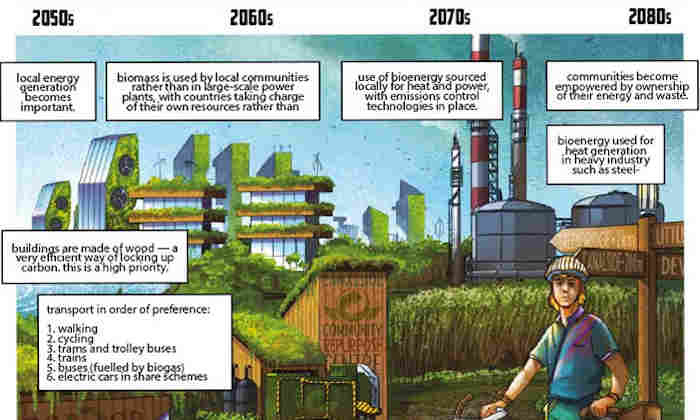 A group of artists and postdoctoral researchers has joined forces to deliver a 24-page graphic novel that addresses the big questions around bioenergy and climate change. Using a juxtaposition of words and images, science and art, the graphic novel was funded by the EPSRC and covers common concerns and benefits. Does growing biofuel compete with growing food? What about all the trees that are chopped down? Does bioenergy really reduce greenhouse gas emissions? The comic’s journey started with ten of the hub’s researchers and four artists attending a two-day workshop. Their mission was to figure out what they wanted to communicate about bioenergy and how. The ideas that rolled out of this session were brought to life over the following six months, leading up to the launch of the comic novel. “Deciding on what to include was tricky,” says Dr Nathan Skillen, a Supergen researcher involved in the project. Professor Patricia Thornley, Director of the Supergen Bioenergy Hub and Professor of Sustainable Energy Systems at The University of Manchester, acknowledges that there are different perceptions and levels of understanding of bioenergy. “Bioenergy can make a huge contribution to providing sustainable and low carbon energy to meet rising global demand,” she explains. “It can come from a large number of sources – farming by-products, crops, sewage or even algae grown in the sea – and offers many benefits that other renewable sources of energy don’t. “However it can also be controversial, with people concerned about the impact on farmland for example. The Supergen Bioenergy Hub she leads is an academic-industry-policy partnership. It’s delivering a diverse range of bioenergy research projects on topics like the fundamental science, the engineering challenges, the economic context, social responses and policy development. The hub recently hosted this year’s International Bioenergy Conference where scientists from across the world came together to share their latest findings. The concluding plenary session included discussion on how and when technologies might be implemented, and how a lack of acceptance and understanding by the general population can be a barrier to adoption. Having the comic as a tool has opened up more opportunities to engage with the public. Dr Skillen sees it being used in different spaces – science festivals, museum workshops, even pubs. Professor Thornley concludes: “As long as we want energy then we will have to pay a price in some form – whether that be economic or environmental. There are lots of different types of bioenergy and the choices we make about those change the impact of providing the energy.